A well-maintained car tends to be more fuel efficient, more reliable, and longer lasting, which are things all of us can get behind. At Liberty Auto Center, our expert automotive technicians have the experience necessary to complete all repairs, installations, and inspections on your vehicle. We begin repair work by diagnosing the problem; for most cars, a dull clunking or thudding noise is the only indication there is something wrong. This forces us to explore multiple options, including the engine, transmission, or exhaust system. During repairs, we use only quality parts and exceptional craftsmanship to complete the job. 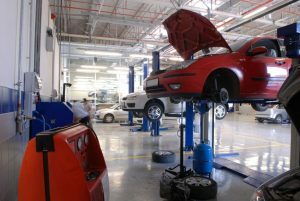 When it comes to auto repair in Derwood, MD, trust only the most professional technicians in the region: those at Liberty Auto Center. Along with auto repair in Derwood, MD, Liberty Auto Center also performs state inspections on vehicles of all makes and models. A car must pass an inspection before being legal to drive on the road. Our automotive technicians will go over your vehicle with a fine-tooth comb, examining safety features and the emissions systems first and foremost. Derwood is located in the east-central portion of Montgomery County, just north of Rockville and southeast of Gaithersburg. The town was initially recognized as nothing more than a train stop along the B&O Railroad back in the 1880s. Later a second, bigger railway station was built, and the community began to grow and flourish. Today, visitors and residents alike enjoy spending time outdoors, interacting with their neighbors, and enjoying good food. Some local eateries include Ledo Pizza and Rokagi Restaurant. If you require the very best auto repair in Derwood, MD or would like an inspection of your vehicle, call Liberty Auto Center today at 240-686-6613 (Flower Hill) or 240-912-5625 (Redland). We would be happy to schedule you for service.